Today’s title comes from a song by a local band, Gil Transit. “New Bad Haircut” was summed up quite nicely after seeing myself on Channel 2 a couple weeks ago. I knew I was in need of a new haircut because the one I had was bad. Then, looking through some old photos in yearbooks at the library, I realized that we’ve all had a series of bad haircuts. Most of the blame falls squarely on our parents, but none of us can even pretend we’re innocent when it comes to bad haircuts. At least now, I have a new haircut that is great. It seems like every boy in the history of the world has had that mom-inspired bowl cut. If your hair is like mine, even that is difficult to accomplish. My hair has cowlicks that make even the steadiest bovine dizzy. On the back of my head alone, my hair grows 90 degrees off from normal. Instead of clipping up and down, my barber has to clip at a mostly horizontal direction. And that’s just the back of my head. The rest of the head is just as bad. I’ve learned that my hair works only at the extremes. Either my hair has to be very short, or very long. I’ve had both. Another old standby for haircuts for boys was the buzzcut. Extraordinarily unpopular in the 70s, the buzz did not fare much better throughout the 80s. Still, we all had them at some point in our youth, it seemed. Despite every effort to stave off the buzz, my parents had my neighbor give me one. Mr. Enzinna was a barber in the Navy. He still had his clippers from those days (I own them now). So, next door I went. I came home with much more than a buzz cut. I think I had some fuzz on the top of my head. He pretty much shaved my head. Just in time for school pictures. Needless to say, I was not the happiest camper in the neighborhood. No. The 80s was the decade of the mullet. Business in the front. Party in the back. The best examples of those days would probably be John Stamos as Uncle Jesse on Full House, or Billy Ray Cyrus. Those were the bookends of mullets. 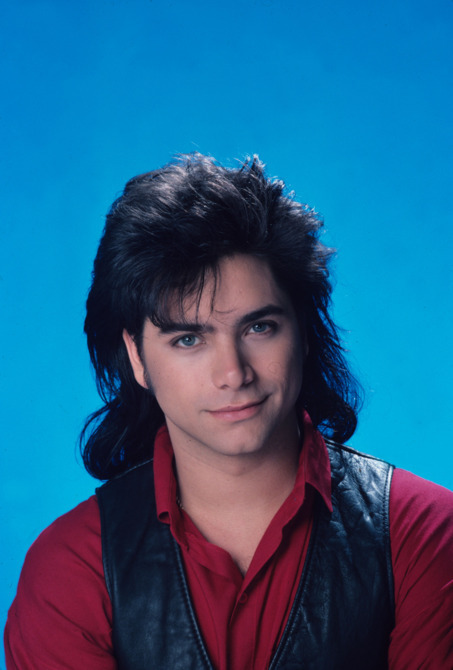 Stamos with the cool one, and Billy Ray with something best forgotten. Leafing through yearbooks from the mid-80s through the mid-90s, the mullet is easily the most popular haircut we had. I always wanted long hair, but my parents didn’t like the top too long, at least while I was still in school. So I worked the mullet. 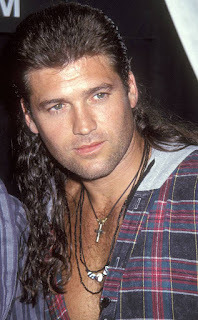 With my wonky hair patterns, I realize now that I was leaning in the Billy Ray direction. I liked it long in back. My cousin, Mike, had long hair like that. I wanted it, too. However, I was on the wrestling team. There were rules about how long your hair could be. I’m not sure they still have those rules, but I pushed to the very edge each week regarding the length of my hair. I wanted to keep it long as possible. However, if it got too long, one of the guys was always read to clip the ends with a rusty pair of scissors. Of course, it was never straight, and it would be a mess afterwards. That meant even shorter hair. The best bet was to keep it just long enough and then stand really, really straight when the refs checked your hair. Once I completed my senior year of wrestling, I let the mullet free. I decided with graduation coming, that I would grow my hair long. Not just the mullet. I was going all-in and growing it hippie long. Once wrestling ended in February, I vowed not to cut my hair. I made it until October. My grandmother hated long hair. She used to complain to Mike about his. When she passed away that October, I cut my hair for her. I went entirely mullet-less, a nice, 1950s haircut for her funeral. I didn’t cut my hair again until the early spring of 2003. When I got my first real job, I had very long hair. Generally, I pulled it back into a ponytail. We didn’t do man buns then, but I’m glad they were not a thing yet. I probably would have cut my hair off at that point. I hate the look. Anyway, with the long hair and being the new guy, I was razzed endlessly. It didn’t really bother me. It’s just hair. As part of all that razzing, though, I got my first real nickname that ever stuck. My co-worker, Don Sweeney, dubbed me “The Hippieboy.” Much like Facebook and Walmart, “The” was eventually dropped and I was simply Hippieboy. At the longest point of my ponytail years, it was between nine and twelve inches long. As I approached my thirties, I decided that the long hair was just too much to take care of and I needed something new. I went with a drastically different look. Another co-worker’s father owned a salon. I surprised Wendy one day when I came home from work and told her I had an appointment to get my hair cut. She never thought I’d go through with it. Either did the guys at work. The morning that I drove to Cheektowaga to the salon I was very nervous. I was only more nervous when I saw that my co-worker, Jason, decided to hang out and watch the whole ordeal. Once my hair was cut off at the band in my ponytail, there was no turning back. I’m pretty sure that Wendy didn’t think I’d go through with it until after that last snip through the collected hair. I hadn’t told her exactly what I was going to do, but did give her some hints. Before the clippers came out to do some buzzing and more trimming, he applied some paste that would bleach my dark, brown hair blond. The first time he checked, my hair was yellow. Barney Rubble yellow. That’s when I got nervous. I figured I might end up having to completely buzz my head because of this ghastly color on my head. 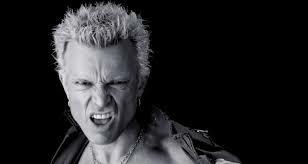 Thankfully it worked out, and I went from the Hippieboy to Billy Idol. That’s the “do” I went with. For a year or so, I’d color my hair. With the blonde, it was easier to add a different color. I had green and purple, although the purple made my hair look gray in some light. There are some days I’d like to bleach it again. I’m not sure how much my current job would like that, though. My old jobs were pretty lenient with it. It finally got to the point where I had to do something. After seeing myself on TV, I knew it was time. I went back to the cut I had when I first cut off the ponytail, albeit without the bleach. (I’ve debated that, though, as I’ve said.) Now, the hair looks much better. The cool thing about hair is that it will (mostly) grow back. In my forties, I’ve noticed that my hair takes much longer to grow. At least I still have hair to style. It’s receded a bit, but it’s not thinning yet. I can be thankful for that. What were some of the haircuts you once had that make you cringe? Unless you’re Joe Dirt, we’ve all had some bad ones. Do you stay with the trends or are you brave enough to forge your own path? The great thing about hair is that you have so many options and you can make a statement. Craig Bacon wishes his hair was more cooperative to try more styles. He will color his hair blue if the Sabres make the playoffs next season. He also says that real friends will tell you when you have a bad haircut. He wants to thank the members of Gil Transit for giving him the inspiration to write about haircuts.